Want to know more about MSU's majors, minors, and certificates? Come learn about MSU’s many possibilities from successful students at Major Madness! 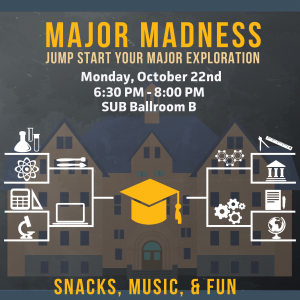 Major Madness, sponsored by Advising Commons and The Academic Advising Center, ASMSU, and The Office of Student Engagement, is an interactive event that lets exploring and declared students learn about programs of interest from successful upper-division students. Major Madness is structured in ‘speed rounds’ to allow attendees to rotate through different areas of interest approximately every 10 minutes. Through these brief interactions, students can learn about multiple majors, minors, and certificates in a fun, relaxed atmosphere. Most importantly, students have the opportunity to connect with successful students who can share their insight and advice about their chosen field of study. This event is great for both exploring students and those declared students who want the advice of our successful upper division students. Attendees may join the event anytime between 6:30 and 8 PM and can choose how many different programs they’d like to learn about. Academic advisors will be on hand to assist students. This event is free and open to all students. Champ Change, snacks, music, and prizes will be offered.